In one of the stranger research projects I've encountered in awhile, French scientists reported on why in the sport of discus throwing, athletes tend to feel more dizzy than those who hammer throw. Whether discus or hammer throwing, both require spinning on part of the athlete before letting the discus/hammer go for long distances. 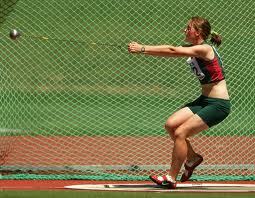 59% report dizziness with discus throwing, but none with hammer throwing. Why? This occurred even among athletes who did both sports eliminating individual susceptibilities to dizziness. Based on slow-motion video analysis, it was conjectured that visual bearings can be used more easily with hammer throwing than during discus throwing. Moreover, less foot contact with the ground for ground-body tactile feedback and generation of head movements liable to induce motion sickness from acceleration were felt to be contributing factors. How do these findings translate to patients who are dizzy? Of note, this research project won the 2011 Ig Nobel Prize for Physics. Dizziness in discus throwers is related to motion sickness generated while spinning. Acta Otolaryngol. 120 (3), 390-5.